Jerry Norman Uelsmann was born in Detroit, Michigan on June 11, 1934, the second son of an independent grocer. He attended public schools and was never a particularly diligent student. During his high school years he became interested in photography as a serious vocation. Uelsmann enrolled at the Rochester Institute of Technology in 1953. The strongest early influence on his creative process came from instructors like Minor White and Ralph Hattersley at the Rochester Institute. As Uelsmann put it, the most significant lesson he learned from White was that his camera had the ability not only to record images, but also that "it did have the potential of transcending the initial subject matter." As a teacher, White was concerned less with teaching the technical details of the camera-lens system than he was with using that system to transform what was seen. 1957 was an important year to Uelsmann. He graduated from the Rochester Institute, marred Marylinn Kamischke of Detroit, and saw the publication of his first photograph in Photography Annual. Uelsmann entered Indiana University's graduate school, to study audio-visual communication. He began work as a graduate assistant in the laboratory at Indiana, but decided that this was not the right field for him. In 1958, he transferred to the Department of Art, where he undertook intensive studies in art history and collaborated with another student to produce a five-part series on photography for a local educational television station. At Indiana, Uelsmann studied with Henry Holmes Smith, who helped to shape his approach to photography as a creative medium rather than just a means of recording a particular moment on celluloid. In an interview with Paul Karabinis, Uelsmann talked about one of his life-altering moments in Smith's class. The class was discussing a photograph by Arthur Segal, a composition involving superimposed images. Uelsmann, who happened to notice a flaw in the picture, declared "I can do it better." He remembers that Smith, described as "an explosive teacher" did not take too kindly to this statement. Smith's reaction evidently strengthened Uelsmann's determination to become technically proficient and make good on his claim. He graduated from Indiana in 1960, with a Master of Fine Arts degree. Soon after graduation, Uelsmann joined the faculty of the Department of Art, at the University of Florida, where he began teaching photography. He helped found the Society for Photographic Education in 1962, delivering a paper on "The Interrelationship of Image and Technique" at the Society's first conference. Uelsmann participated in his first group exhibition and was featured in the "New Talent USA" section in Art in America. In an interview with Paul Karabinis, Uelsmann spoke of the attitudes he encountered when he started his career 30 years ago. As he recalls, the establishment at the time was very rigid about how a photograph ought to look. It was a very purist approach in the tradition of Ansel Adams and Edward Weston. Gradually, "as photography became more and more a part of total art programs, as it has here at the University of Florida, a lot of cross-fertilization occurred. People from a photographic base began to have more and more dialogue with people from other disciplines. That's when the wonderful expansion (in photography) began." Uelsmann held his first major solo exhibition at the Jacksonville [Florida] Art Museum in 1963. In 1966, he became an associate professor, at the University of Florida, and was elected to the board of directors of the Society for Photographic Education. The following year, he held a solo exhibition at the Museum of Modern Art, in New York, and was awarded a Guggenheim Fellowship for "Experiments in Multiple Printing Techniques in Photography." Uelsmann lived and worked in Gainesville, Florida during the period of his fellowship. By then, he had completed building his home, which incorporated a darkroom where he could continue experimenting and refining his technique. He calls the darkroom his "visual research laboratory." He was introduced to the European audience the same year, when his work was published in Camera. In 1971, Uelsmann went on leave under a faculty development grant from the University of Florida for the academic year, and spent much of that time travelling, delivering lectures, and holding workshops. He delivered the fourth Bertram Cox Memorial Lecture for the Royal Photographic Society, in London, titled "Some Humanistic Considerations of Photography." The lecture was repeated in four other cities. The National Endowment for the Arts granted Uelsmann a fellowship in 1972. The following year, he was made a Fellow of the Royal Photographic Society of the U.K. He continued to hold exhibitions and visit academic institutions around the country presenting lectures and workshops. In 1974, Uelsmann became a graduate research professor at the University of Florida. He divorced his first wife and married F. Diane Farris in 1975. Uelsmann has exhibited his work in more than 100 individual shows in the United States and overseas. His photographs are included in the permanent collections of major U.S. museums as well as those in Japan, Sweden, France, and Australia. Uelsmann's work defies easy definition, but his photo fantasies have a quality that captures the interest of even the most down-to-earth of his viewers. He attributes the appeal of his photographs to a human response that is "pre-verbal," in his words; defined as something beyond language that connects one with aesthetic experiences such as music. Uelsmann's book Process and Perception (1985) revealed, frame by frame, how he synthesizes his final print from the negatives chosen for a given composition. He uses only his own negatives from the pictures he shoots, often without a specific composition in mind, and maintains a vast collection of negatives for what Peter C. Bunnell called "his visual vocabulary." John Ames, an instructor at Santa Fe Community College and occasional film critic for National Public Radio, wrote: "Uelsmann is able to link opposites in ways that seem credible. The observer is forced to consider the photograph's implication that both the natural and the artificial spring from the same source." 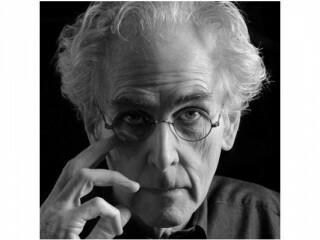 View the full website biography of Jerry Uelsmann.